Search for all "Ly6A/E / SCA1"
Rat anti Mouse Ly6A/E / SCA1 238B. Product is tested for Flow Cytometry. This product was originally produced by MBL International. Flow cytometry: 10 μg/ml. For details see protocol below. Sca-1 is a member of the Ly-6 antigen family which molecular mass of 8 kDa under nonreducing conditions and of 18 kDa under reducing conditions. Mouse hematopoietic stem cell expresses low levels of Thy-1 antigen (Thy-1lo) and to be lineage-negative (Lin-); not express markers characteristic of B cells (B220), granulocytes (Gr-1), myelomonocytic cells (Mac-1) and T lymphocytes (CD4 and CD8). Recently, new monoclonal antibody, anti-Sca-1, was used to purify stem cells from the Thy-1lo, Lin- bone marrow subpopulation. Thy-1lo, Lin-, Sca-1+ (but not the Thy-1lo, Lin-, Sca-1-) population of bone marrow cells are highly purified pluripotent stem cells. They read out with nearly unit efficiency in assays for primitive myeloerythroid and thymic progenitor, and have a capability to admit lethally irradiated mouse to survive and be restored in all blood-cell lineages. The Thy-1lo, Lin-, Sca-1+ subpopulation thought to have all stem cells present in the bone marrow. We usually use Fisher tubes or equivalents as reaction tubes for all steps described below. 1) Detach the cells from culture dish by cell dissociation buffer. 2) Wash the cells 3 times with washing buffer [PBS containing 2% fetal calf serum (FCS) and 0.1% NaN3]. 3) Resuspend the cells with washing buffer (5x10e6 cells/mL). 4) Add 50 µL of the cell suspension into each tube, and centrifuge at 500 x g for 1 minute at room temperature (20~25oC). Remove supernatant by careful aspiration. 5) Add 10 µL of normal goat serum containing 1 mg/mL normal human IgG and 0.1% NaN3 to the cell pellet after tapping. Mix well and incubate for 5 minutes at room temperature. 6) Add 40 µL of the primary antibody at the concentration as suggest in the APPLICATIONS diluted in the washing buffer. Mix well and incubate for 30 minutes at room temperature. 7) Add 1 mL of the washing buffer followed by centrifugation at 500 x g for 1 minute at room temperature. Remove supernatant by careful aspiration. 8) Add 30 µL of 1:40 FITC conjugated anti-rat IgG diluted with the washing buffer. Mix well and incubate for 15 minutes at room temperature. 9) Add 1 mL of the washing buffer followed by centrifugation at 500 x g for 1 minute at room temperature. Remove supernatant by careful aspiration. 10) Resuspend the cells with 500 µL of the washing buffer and analyze by a flow cytometer. Petersen, B. E., et al., Hepatology 37, 632-640 (2003). Store (in aliquots) at -20 °C. Avoid repeated freezing and thawing. PBS containing 50% glycerol, pH 7.2. No preservative is contained. 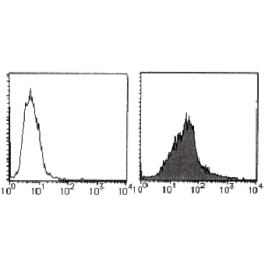 This antibody reacts with Sca-1.